You are here: Home / Jewelry / Brooches / Three exquisite Jean Schlumberger brooches. Three exquisite Jean Schlumberger brooches. Today, we’re going to take a look at some fabulous Jean Schlumberger brooches. Two are animals, one is a vegetable. I’m sure you’re excited already. 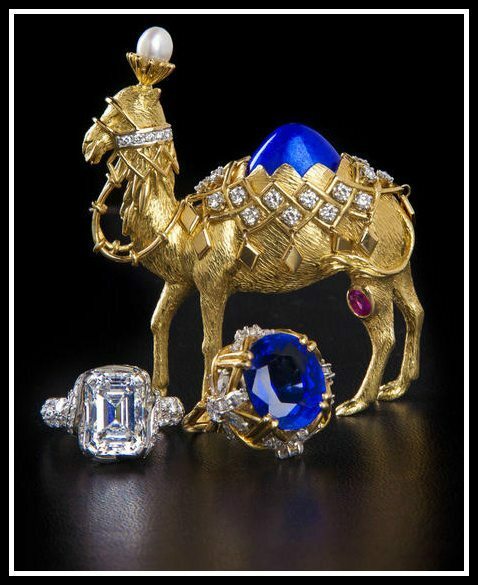 It’s hard to imagine ever waking up in the morning and thinking, “Today requires a camel brooch!” but maybe if I had a camel brooch like this one I’d be familiar with the feeling. I especially enjoy how the good folks at Bonhams posed it marching through a dark desert strewn with other jewelry. The gold camel is wearing a cultured pearl headdress (fancy! 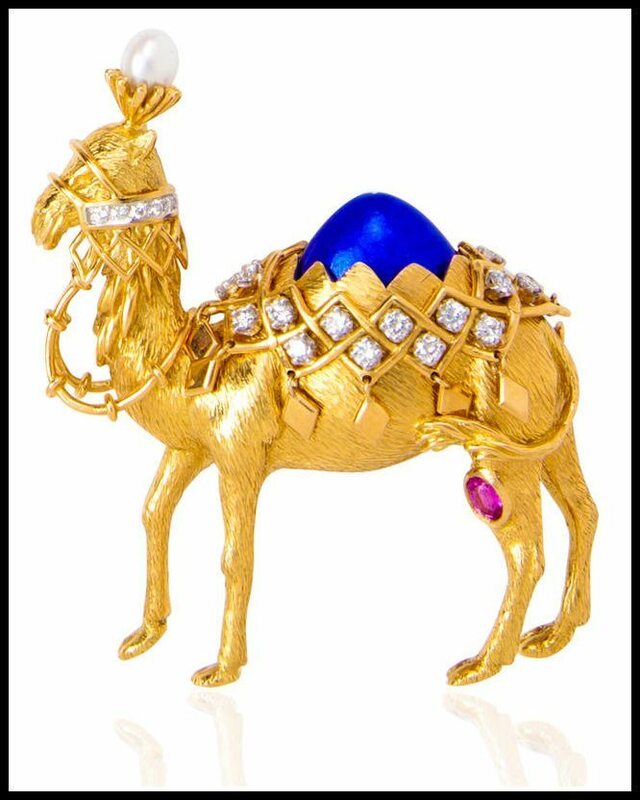 ), has a vivid blue pailloné enamel hump, and is further adorned with circular-cut diamonds and one oval-cut pink sapphire. In this image, you can really see the texture of the gold. I’m almost expecting the camel to turn his head and shake the reins, or for its fur to blow in the wind. It’s more of a tiny statue than anything else. I admire it greatly, but I’m still having a hard time imagining how anyone would wear it. On the lapel of a blazer or collar of a coat, perhaps? What do you think? Here’s the eggplant, since I’m sure you’re excited to see the vegetable brooch. 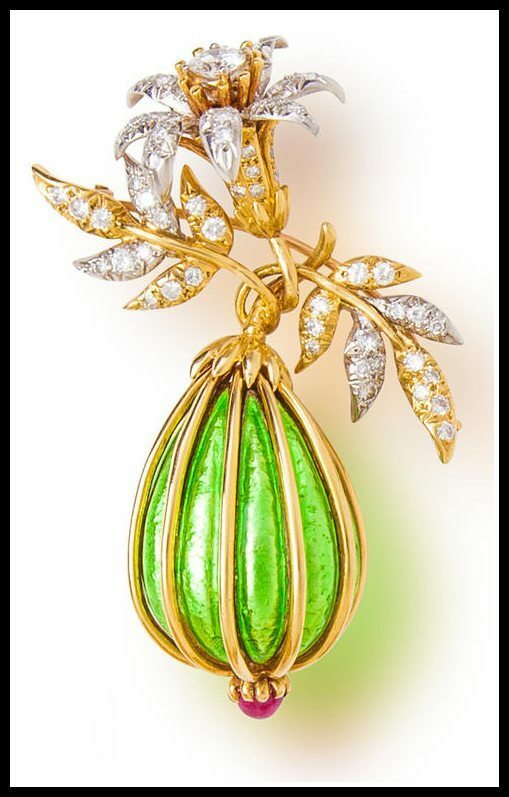 The “eggplant” itself is made of bright green pailloné enamel and is adorned at the bottom with a ruby cabochon. The eggplant is striped with gold and is suspended from a very pretty brilliant-cut diamond spray of leaves and flowers. Look how precise the angle of each of those flower petals are. I have to say: as visually appealing as this is, I don’t think it looks overly much like an eggplant. Shouldn’t it be purple? Maybe it’s not ripe. I’ve only ever seen eggplants in a grocery store or on my plate. 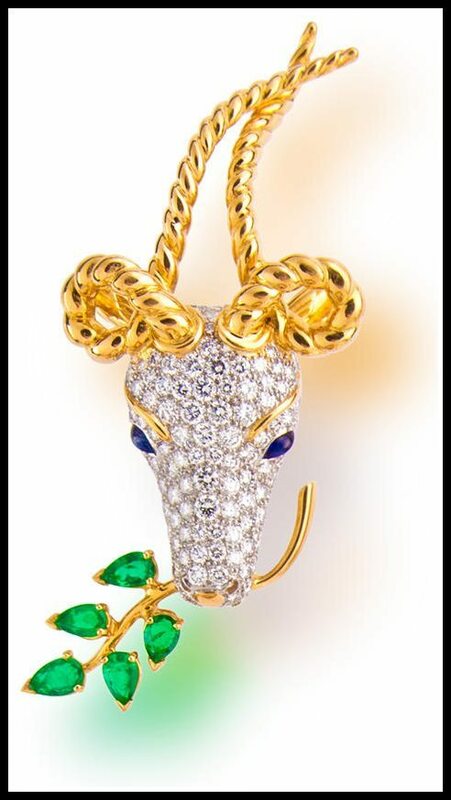 Last but not least of today’s Jean Schlumberger brooches: the gazelle. The pavé-set diamond head features haunting, cabochon sapphire eyes and supports two delicately twisting gold antlers and textured ears. The gazelle carefully holds a gold and pear-shaped emerald branch of leaves in its mouth. I really, really like this one. It feels so deliberate, from the tilt of the gazelle’s antlers to the curl of the green leaves. Which brooch was your favorite? These Jean Schlumberger brooches were all listed in an October 2013 Bonhams auction. Please see individual descriptions for links to listings. All images and info are thanks to Bonhams.